Elementary students and senior adults in Kamloops, British Columbia, exchanged welcoming waves, shy smiles and warm introductions in June as the two groups met for the first time. The children and adults are PaperPals, and they had been exchanging handwritten letters through the Domtar program, which partners elementary school students with members of a retirement community. Participants in the PaperPal program not only benefit from the relationships created through handwritten correspondence, but they also enjoy the neurological benefits of putting pen to paper. Domtar tested the program in 2015 at a school and a retirement community in Van Nuys, California. That project, chronicled in this short video, was so successful that the groups wanted to continue writing letters after the two-month program ended. Since then, the PaperPal program has spread throughout the United States and Canada, including Kamloops, where Domtar operates a pulp mill. Volunteers at the mill were eager to bring PaperPal to their community as part of their work with the EarthChoice Ambassadors program, which encourages employees to make a difference. 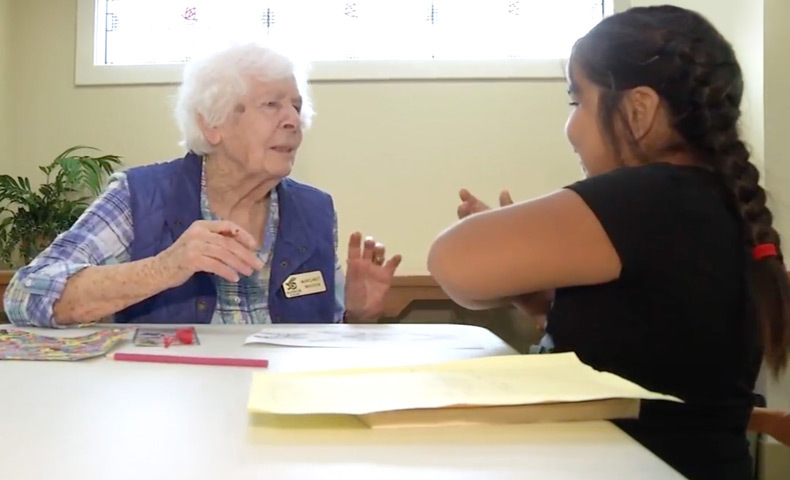 Students at Summit Elementary School and adults at the Berwick on the Park retirement community continued their conversations when they met in person. They talked about how their childhoods compared. “The great memories from this experience will remain with all of the participants for a very long time,” said Mike Sun, a technical and customer services manager at the Kamloops Mill. Handwriting has been proven to provide many cognitive benefits to the developing minds of young children. It’s also a useful brain exercise for aging adults. But what’s more, a handwritten note in the electronic age makes people of all ages feel special. Shaw TV also covered the event with this video.